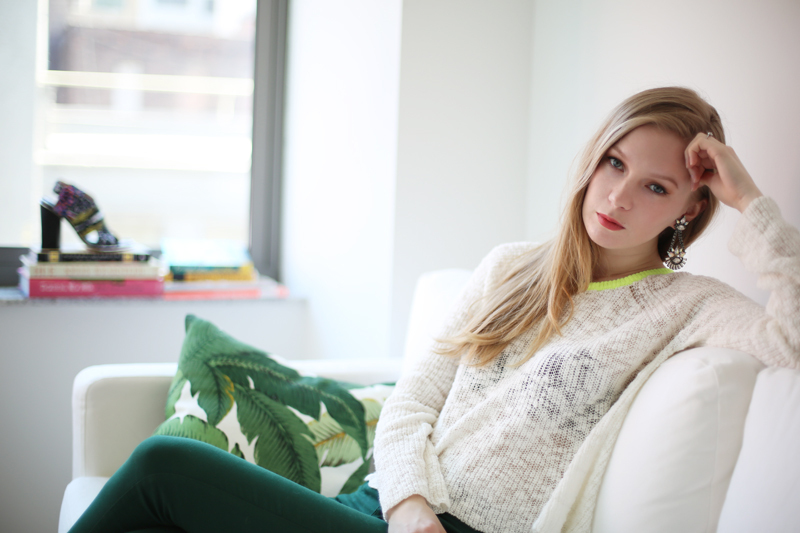 This entry was posted in Outfit and tagged andemiu, apartment, green, Home by Carolina Engman. Bookmark the permalink. I love how light your place is, definitely curious to see more ! I really hope you enjoy your new lifestyle. Adorable look! Sweater is great! Ahhh, can’t wait to see more of it! Beautiful ! I love these type of photos where it’s explicit the relaxed moments ! From the little we can see, it is beautiful! I can’t wait to see more pictures, and I am sure your taste in decoration is as good as your taste in style! Oh gosh you are so pretty ! We find you look like a real lady ! I’m really curious about your apartment! your outfit is really fine. the mix of the colour is great!! Your new place looks nice !! Adore those heels and pillow case! Can you tell me where the pillow case is from? I haven’t seen any green trousers for a while…beautiful color! So nice pics and perfect jeans and earrings. Have a nice day. Your shoes are awesome! I can’t wait to see your apartment all decorated. I really cannot wait to see more of the appartment! Definitely show us more pictures from your apartment! Lovely comfy look and those earrings are super pretty! woow, love your green look!!! Love the bright white walls, looks so summery! You look so pretty! Can’t wait to see more photos. Yes, can’t wait to see your apartment! And those cushions are just lovely, tropical print cheers me up! I love that your outfit is coordinated with the sofa and cushion :3 Your apartment looks so beautifully bright! I love the neon touch of your sweater! I love your Sweater and the pillows looking amazing with the with Couch. I see plenty of light, which I love in my home too. Is that a shoe-shaped book holder? Brilliant! Great cushions and matching outfit! The one thing that really stood out to me was those amazing earrings. Beautiful outfit and you’re apartment looks super cute! You are so beautiful in these two photos! looking amazing already, can’t wait to see more of your apartment! The cushions look fabulous! Can’t wait to see the finished abode. It looks absolutely beautiful so far! I bet it will be beautiful!! so far, love it! can’t wait to see more! Gorgeous pictures, you look lovely! Oh, it looks so fresh and welcoming. I can’t wait to see it when it’s all finished. Great Picture. Looks very airy. Looks so sleek and sophisticated. Love your green jeans! Looks amazing so far! I can’t wait for a full post on it. Beautiful. I’m very curious about the whole interior! I really love your pants. Can’t wait to see the rest of your apartment when you’ve finished decorating! Can’t wait to see more of your apartment! Love your style and taste. I love that pillow and your pants! Can’t wait to see the whole apartment! You look gorgeous! We know this post is meant to give an insight on your new apartment but can we just say how beautiful you look? Stunning. You wear green well and those Zara heels are everything!! Here at ChicTrends we’re absolutely delighted to have found your site and look forward to reading more! If you’ve got time do visit our site! http://chictrends.co.uk/ Best to you! loveee the earrings and your style!!!! Love your outfit so fresh. Great corner of your apartment. Loving your knit and heels. It is so fresh and light! I am curious to see more! When in Williamsburg, Brooklyn, coffee?